There are lessons from the 2008-09 recession that the banking industry should have taken note of to prevent egregious lending errors from happening again. But it looks like those lessons were ignored, and history may naively repeat itself. Cov-lite loans, which eviscerate most of those standards, now comprise 77 percent of the corporate loan market, which in turn is valued at $1 trillion. That’s more than 5 percent of our GDP. … a type of loan that is extended to companies or individuals that already have considerable amounts of debt and/or a poor credit history. 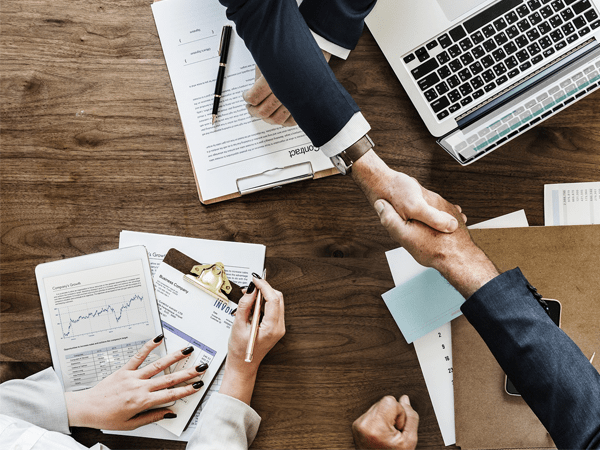 Lenders consider leveraged loans to carry a higher risk of default, and as a result a leveraged loan is more costly to the borrower. 1. Former Federal Reserve Chair Janet Yellen, for instance, said in December that the leveraged loan industry, which now boasts around $1.3 trillion in assets, is one area where risk-taking could exacerbate an economic downturn. 2. Moody’s Investors Service, which rates the debt, said covenant quality, or the protection banks and investors get for the loans, has reached historic lows. What’s telling from the chart above are the $557 billion of outstanding loans in 2007 compared to the $1.15 trillion now. 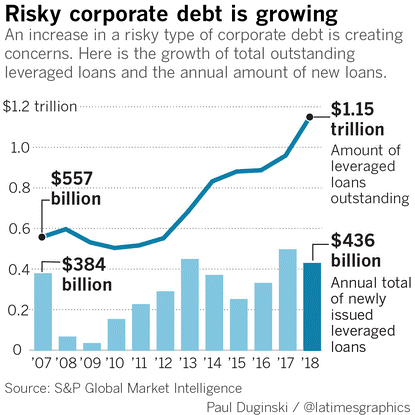 If all this high-risk corporate loan activity has a familiar “feel” to the subprime mortgage loans made to individuals in 2008, you would be right. The years leading up to the 2008-09 recession were loaded with “simple interest” loans made to people in the subprime market. But when that credit bubble burst, it set off a firestorm that led to bail outs, new financial policy and panic. Except this time, the borrowers aren’t individuals with $250,000 mortgages though. According to the same Los Angeles Times piece, it’s corporations like Uber and Burger King taking out leveraged loans and taking on millions in debt load. Debt load that can crush a company and force it into bankruptcy. This “weakly” underwritten debt has to be paid at some point. When the tab is due, if interest rates rise at any point in 2019, that could certainly prolong a headache, and there’s already a good possibility that two rate hikes are coming. If a recession hits this year, debt load like this could potentially cause bankruptcies to soar, and make the recession last much longer. This type of debt already claimed Toys R’ Us as a victim of bankruptcy. All it’s going to take for trouble to arise is inflation to rise out of control and reduce the ability for these corporations to pay back their debt, and there is quite a big tab to pay. Plus, the Fed isn’t giving a clear signal as to whether or not it will continue to hike rates this year. So it looks as though the market may be propped up by companies that are in massive amounts of “junk” debt. That, and the recent recession showed us that housing market optimism was pushed until it was too late. Lessons from that period sure don’t seem like they were learned. So if you don’t want your hard-earned savings to be exposed, make sure you hedge against the next recession. Diversifying your portfolio with assets known to be hedges such as physical gold and silver is a strategic way to protect your wealth. Don’t wait for the ship to sink. The best time to prepare for an emergency is before it happens.